Around 5:50 a.m. Monday, a semi-truck collided with a bear near Goleta. The crash occurred on Highway 101 near Winchester Canyon Road. The semi-truck driver did not suffer injuries in the crash. Authorities have not announced a cause of the crash. The CHP was coordinating the removal of the bear from the highway. On the night of April 2, a Grover Beach woman struck and killed a bear that dashed in front of her vehicle as she was driving on Highway 101 north of Highway 58. The collision caused the woman’s vehicle to flip over and slide about 50 feet down the highway. She managed to escape the crash without any injuries. 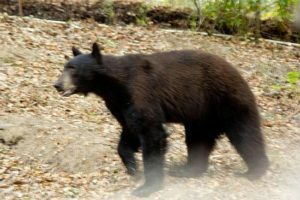 Early in the morning on May 12, a car collided with a large bear near Lake Cachuma on Highway 154 in Santa Barbara County. Two people in the vehicle suffered minor injuries and were taken to the hospital. A day prior, a black bear that weighed between 200 and 300 pounds was spotted walking around a Goleta neighborhood. Goleta Councilwoman Paula Perotte woke up to find the bear in her backyard. Perotte snapped a photo of the bear peering into her home as her dog stared back at it. California Fish and Wildlife staff tracked the bear and fired a tranquilizer dart into the animal. Fish and Wildlife personnel then relocated the bear into a suitable habitat in nearby wilderness. This is a sad result of a ban on bear hunting with dogs. This is a sad result of the CA Dept of Fish and Wildlife being infiltrated by the organized-crime fascists of HSUS. Glad it was a semi truck and not someone in a Honda Civic. Idiot bureaucrats will STILL not approve a bear hunting season. Increased traffic on 101 has made it nearly impossible for anything or anyone to cross safely from one side of the freeway to the other. Tongue in cheek? I hope. UCSB or CalPoly profs should request a grant to study the recent increase in bear suicides. What is sad is that the government would probably fund it, but on the other hand maybe a few of the Profs would try to cross the road.